High-quality putters are intricately manufactured and tested clubs. 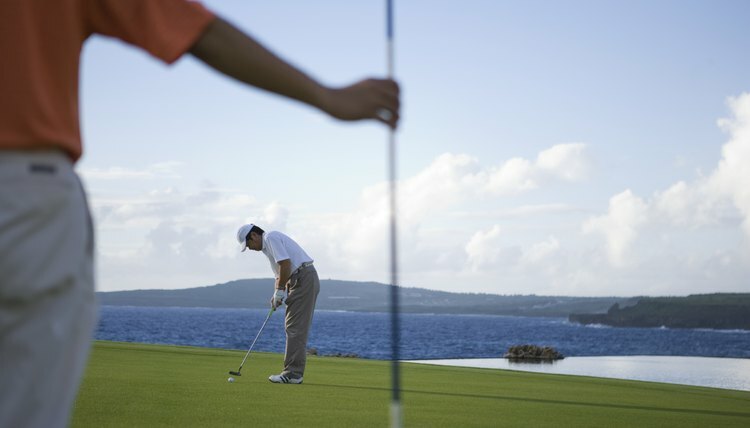 The putter is the smallest club in a set of golf clubs, yet is the club with which the most strokes are taken. The art of designing and manufacturing putters has been mastered by a number of companies that produce high-quality, top-of-the-line putters. A high-quality putter is usually made of finely milled metals and usually is either aesthetically pleasing or has a eccentric, yet functional design. Scotty Cameron founded Cameron Golf International with his wife in 1992. Prior to starting Cameron Golf International, Scotty Cameron worked for other golf companies' design teams, including Ray Cook Putters, Maxfli Golf and Mizuno Golf. Cameron joined his company with the Acushnet Co.--which manufactures the Titleist and FootJoy brands--in 1994, a relationship still in existence as of August 2010. Scotty Cameron's putters are played by a majority of PGA Tour players and top amateur golfers and are also highly sought after by putter collectors. Cameron has a state-of-the-art putter studio in Carlsbad, California, where most of his designing and putter manufacturing is completed. Bettinardi putters are manufactured by Bettinardi Golf Ltd. Bob Bettinardi is the founder of Bettinardi Golf. Prior to designing and manufacturing putters, he was an engineer of products for the defense and medical equipment industries. Bettinardi putters have been used on the PGA Tour by the likes of great golfers such as Jesper Parnevik and Jim Furyk. Bettinardi uses a honeycomb-shaped milling process to mill the faces of his putters, producing a putter face design like no other putter on the market as of 2010. In addition to milling high-quality putters, Bettinardi also mills high-fashion belt buckles that are favored among golf equipment enthusiasts. Odyssey Golf began producing high-quality putters in 1991 when it produced a one piece putter head made of a revolutionary polymer called Stronomic. The putter quickly gained acceptance on the PGA Tour. However, the release of the White Hot 2-Ball Putter in 2001 catapulted Odyssey Golf into the position of the No. 1 putter in golf. The White Hot 2-Ball Putter is the highest-selling putter by units sold in history. The putter features two white discs on top of the mallet-shaped head to assist golfers in lining up putts more accurately. Odyssey has a wide range of putters that are widely used on all major professional tours. The company was purchased by Callaway Golf in 1997.